It’s time to drop a few truth bombs about one of the most common, yet underappreciated building and decorative materials available: concrete. Concrete doesn’t have to be drab and gray, hidden within the framework of a building, nor does it belong solely outside. Concrete is like a chameleon, capable of looking and performing like a high-end material at a fraction of the cost. Let’s take a look at a few of the ways in which you can incorporate concrete into your home to create a fresh, innovative look that is also low-maintenance. Concrete makes an attractive and durable flooring option inside the home. Sun rooms, mud rooms, bathrooms, dining rooms, kitchens and even living rooms can all look updated and modern with a concrete floor. The key is to make sure the concrete has the right color and texture for the room so that it complements the overall look. To color concrete, a powdery substance can be added to the mixer before the concrete is poured. This results in a permanent color that is integrated throughout the entire layer of concrete. The other option is to stain the surface of the concrete. Dozens of colors are available for both options. Many possibilities exist with adding texture to concrete. Concrete can be stamped to look like tiles, stone or even brick. Or, you can leave it flat. Concrete floors can be polished to give a high shine, and a non-slip sealer keeps the floor safe to use. According to TexCon Ready Mix, properly insulated concrete will not become damp, and if the room gets plenty of sunshine, the concrete will also retain heat and be extra cozy on your feet. However if a cold floor is a real concern, installing heated elements when the concrete is poured is a better long-term option. In short, if you’re ready to try something new and exciting on a budget, check out concrete flooring. It’s far more beautiful than the name implies. Aside from its use as a flooring option, concrete also shines in the home when used as a countertop material. A concrete countertop is an easy way to add a customized touch to your kitchen. Everything from the color to the edge design can be made to order; there’s even an option to embed other materials into the concrete before it dries. A few important thing to note about concrete countertops is that you can place hot items on them, use them as a chopping board, or have a stain-free countertop. “Or” is the operative word here: to have a stain-free concrete countertop, a sealer must be applied. But this sealer can be damaged by the heat of a hot pan or by knife marks. The sealer can be repaired, but it’s an extra maintenance step that some people wish to avoid. To skirt around the issue, some people embed trivets into the counter top so that hot pans have a safe place to rest. Another common addition is a drain board, which allows you to set aside items to dry after rinsing. The water drains straight into the sink. And, if you’re looking for an easy place to scoot trash and composting materials, place a hole in the concrete countertop that leads directly to pull-out trash cans underneath. Installing concrete countertops gives you the perfect excuse to make your kitchen as user-friendly as possible. Hate scrubbing mildew off the grout in your shower? Go for a permanent remedy and remodel using concrete. It’s usually troweled on when installed but there are no seams, while sealers make it extra easy to maintain. A non-slip material can be integrated into the sealer to prevent accidents from occurring, and/or a broom-swept texture can be used to give even more traction. 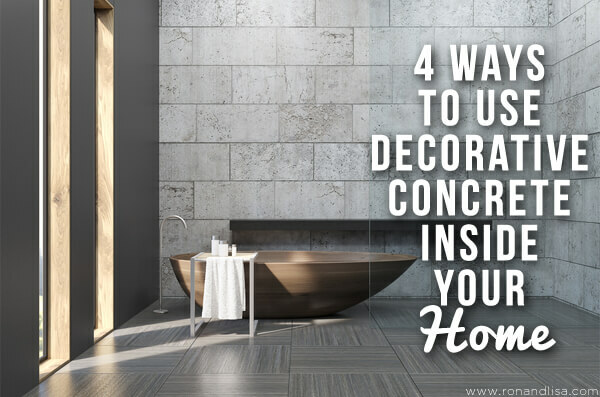 If you haven’t realized it by now, the colors, style and design of incorporating concrete into your shower can meet your heart’s desire (just be prepared to pay up for more extravagant details!). Concrete tubs are also a unique and creative possibility to add your own personal signature. Finally, concrete makes a show-stopping feature when used to create a fireplace hearth. Keep it seamless to create an impressive, monolithic structure. Or, stamp concrete to give the appearance of brick, without the added maintenance. A skilled concrete installer can color stamp concrete to give it depth via shadows and highlights, while no one will be able to tell the difference. In addition, concrete retains heat and will radiate the heat from a fire long after it’s been doused for the night, making winters even more comfortable. Are you convinced that concrete is capable of creating a contemporary and practical aesthetic in your home? Explore all of its possible uses inside and outside your own home; you’ll be hard-pressed to find a more durable and flexible building material than concrete. Guest blogger, Cathy Habas, is a freelance writer based in Louisville, KY. She is a content developer for Dirtwirx.com, writing pieces of interest for both construction crews and homeowners alike. Love that you are promoting concrete! I’ve been in this business for awhile and just within the 5 years has decorative concrete exploded, at least down here in south Louisiana. Keep posting! Nice job on this post! I love the growth of interior concrete in the last few years and I will be sharing this with clients. We have interior concrete floors in our home and adds such a great modern feel! Thank you for all the fun ways we can use concrete in our homes. I have always liked the look of decorative concrete and I have been wondering how I could have it in my home. I really like the idea of having concrete flooring. I’m glad that it can be a really durable flooring option. Great info! Decorative concrete inside the home adds such a nice touch!